You shouldn’t judge a book by its cover, and you shouldn’t judge a hand tool by its exterior, either. 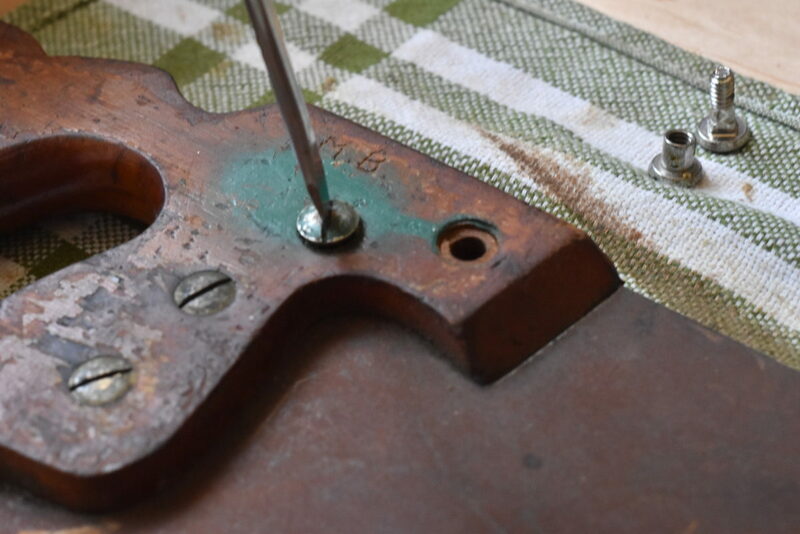 Sometimes a great tool is hiding under a film of rust, and with a little elbow grease and a couple of household ingredients, it’s not too hard to get that old tool shining again. Even better, this recipe doesn’t use any harsh chemicals, so you can feel good about keeping the environment clean, too. The acidity of lemon juice helps to loosen rust from the metal underneath, while the salt acts as a gentle abrasive that won’t leave scratches in the steel. Both are environmentally friendly and won’t damage your skin or lungs as you use them. If you have any small cuts on your hands, if your skin is particularly sensitive (the salt is quite gritty), or if you just want to avoid getting dirty, you can use gloves, but it’s certainly not necessary. Start by removing anything that’s removable. Rust can creep between surfaces and it’ll be easier to get into tight corners if they’re no longer corners. Next, mix equal parts salt and lemon juice in a small bowl. The exact ratio isn’t important, and it’s fine to add more lemon juice or more salt as you use one or the other faster. 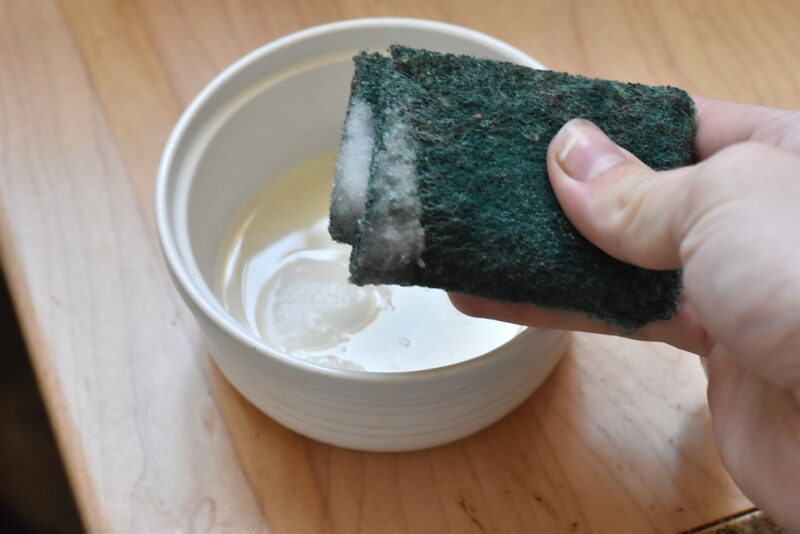 Use your abrasive pad to lift the mixture out of the bowl, and start applying it to rusty areas on your tool using small, circular motions until the entire surface is coated. If the tool has been collecting dust for a long time, it may have an oily layer on the surface that will make the lemon juice mixture pool up into droplets instead of spreading out evenly. If you notice this, make sure to scrub until the oily areas have been penetrated and the lemon juice no longer forms droplets. This shouldn’t take more than a few seconds in any one area. Let the lemon juice mixture sit on the tool for between 30 minutes and 2 hours. Don’t let it go too long (like overnight) because the water in the lemon juice will start forming new rust once it’s penetrated down to good steel. 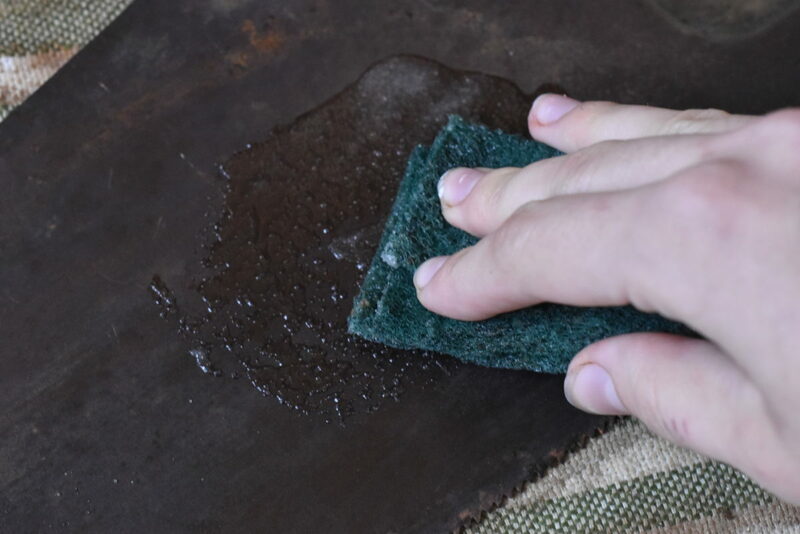 After soaking, use your abrasive pad in circular motions again to knock any loose rust free. 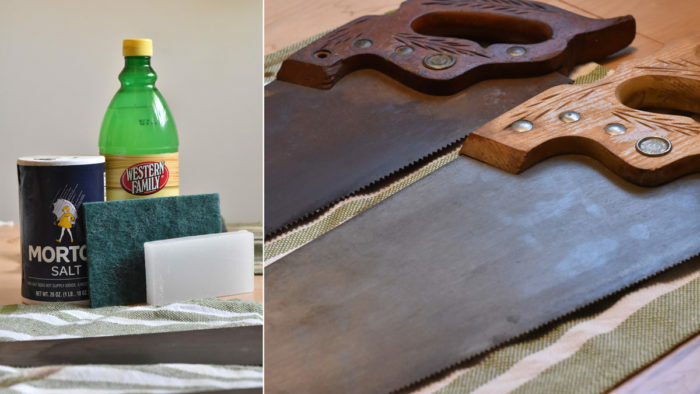 You should be able to remove quite a bit of rust by applying some elbow grease here, but if any areas are being stubborn, rinse the tool off in the sink, dry it completely with some paper towel or a clean rag, and give it another round of lemon juice and salt, letting it soak for a couple hours again. 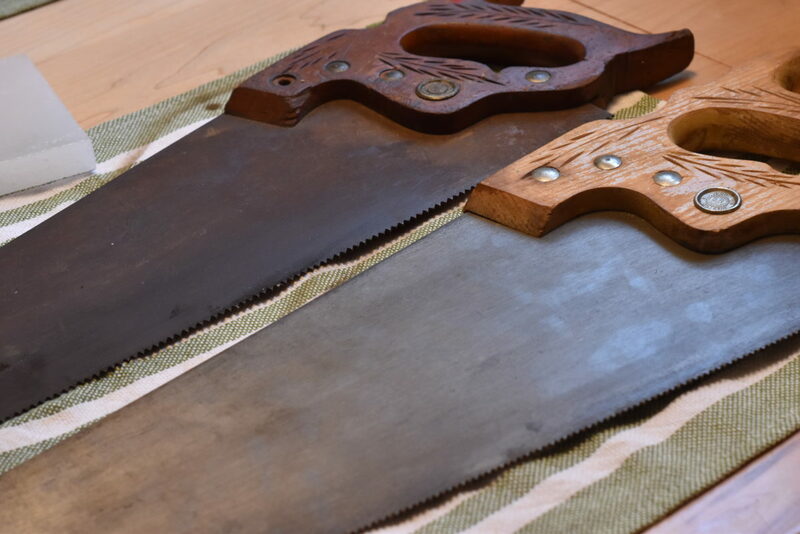 Because my saws were so heavily rusted, I went through the entire soaking and scrubbing process 3-4 times per side. When all the rust is gone, give the tool one last rinse in the sink, rub it down with paper towel and then let it dry completely. Once it’s dry, you might notice a thin orange sheen of new rust on the fresh steel. 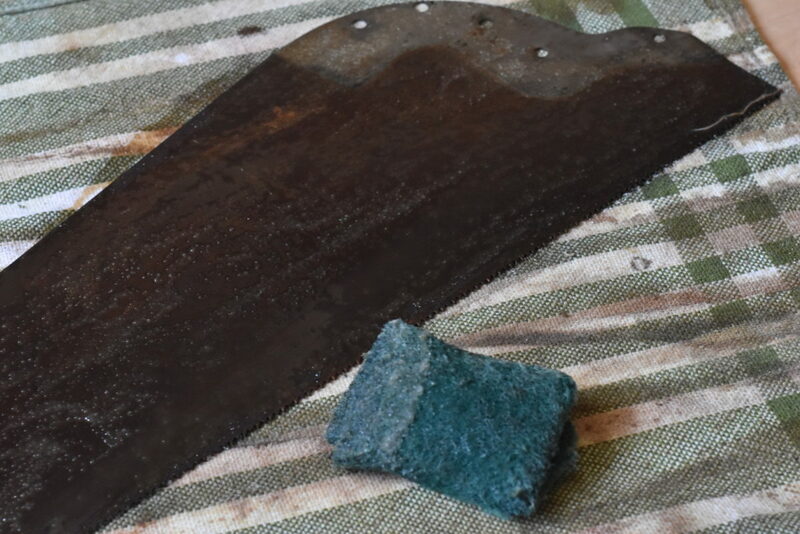 Using a new, clean abrasive pad, give the tool a once over until it’s shining right before applying your preferred rust protectant. Put the tool back together and you should be good to go. Amy Costello is known for her delicate chip carving on turnings and small joinery projects. While she has built furniture in several industrial sized shops since starting in 2014, she currently does all of her woodworking on a 6-by-10-ft. platform in her bedroom, with a long curtain splitting the room. When she’s not in the shop, Amy enjoys writing, tending her cut flower garden, and enjoying her husband’s homemade artisan bread. Find her on Instagram @amy.makes.everything.